Fun Jumpers and Party Magic has all the fun and entertainment one could ask for. 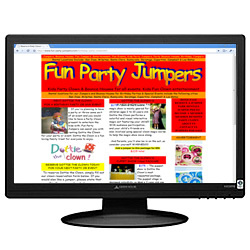 Fun jumpers and Party magic offers Dottie the Clown for all your magical needs. Dottie the Clown’s magic performance is out of this world. She’ll have you guessing and wondering how she does her tricks. It’s always magic time at Jumper 4 Kids Party Magic Shows. We offer Dottie the Clown, she’s one of the best children’s magician in the Bay Area. Dottie the Clown’s performance is a “Can’t Miss”. She will razzle and dazzle you with her clown magic. Dottie the Clown also does puppet shows, balloon twisting, and face painting as well as magic shows. You can rent Dottie the Clown for magic Shows, or for a variety of acts. To reserve Dottie the Clown, call (408)726-8591 and let the Magic Show begin.